Great choral singing in the home of Sir Thomas Beecham. 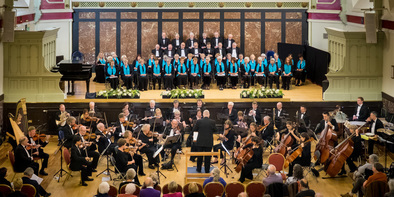 St Helens Choral Society is a mixed choir of over 60 voices, founded in 1949. We currently present three concerts a year of high-quality choral music. Find out more here. We have a scheme called Friends of St. Helens Choral Society. Those who join will receive a membership card entitling the holder to a 10% discount on 2 tickets per concert and also a free programme. Members will also be welcome at an open rehearsal to see us at work as we prepare for concerts. Find out more here. If you would like to receive regular updates about our society, then please complete and return the attached form. Alternatively, please complete our on-line form by clicking here. Are you interested in singing? We are looking to increase our membership, particularly of tenors and basses, to improve the balance of the choir in performing the large-scale works which are our speciality. Find out more here. The price is £10 for all except students at £1. Find out more about concerts for 2019 here.